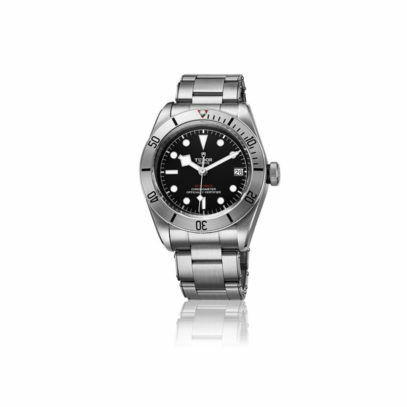 Here’s a fun fact you might not know: the Tudor watch brand was actually founded in 1946. 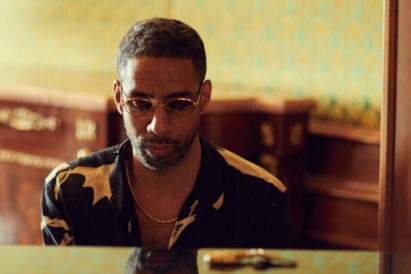 I mention that because, in spite of its lengthy history, it is only in the last few years that Tudor has established itself as the hip, wear-everyday watch brand for stylish young gentleman who know better than to put something with a battery on their wrists. 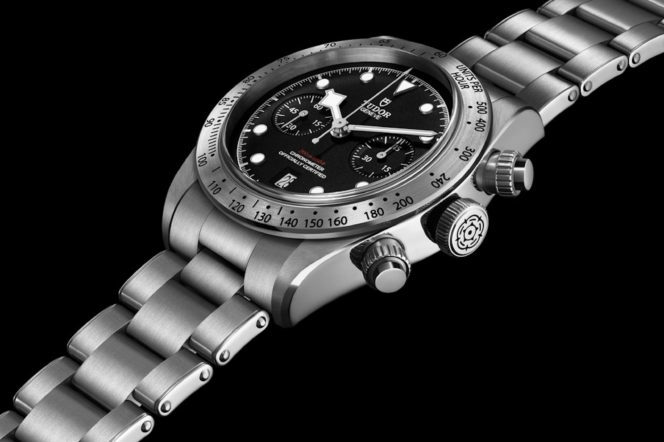 Building on sixty-years of know-how and offering a balanced blend of cool functionality, the Swiss watch-maker looks set to continue its all-out assault on the mid-to-entry level sports watch market, introducing four new models into the Heritage Black Bay family at Baselworld. Leading the charge is the Heritage Black Bay Chrono, Tudor’s self-described hybrid chronograph that combines the aquatic heritage of the Black Bay family with the brand’s strong association with the racetrack. 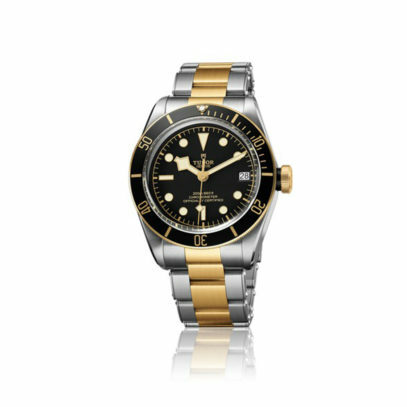 Presented in a very wearable, 41mm steel case with a polished and satin finish, the watch came as something of a surprise to Tudor watch fans everywhere, although not an unwelcome one it seems. 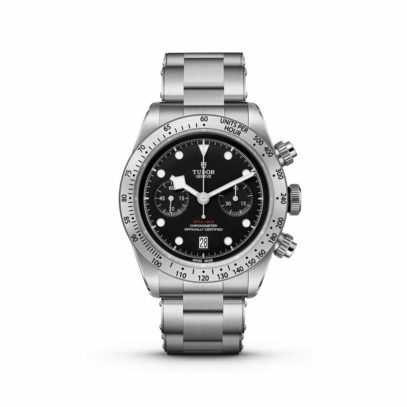 As the first chronograph in the Heritage Black Bay collection, highlights include the iconic snowflake hands, an over-sized screw down crown complete with the Tudor rose engraved and lacquered in black and a high-contrast dial for optimum readability in all conditions. A fixed bezel in circular satin-brushed steel with an engraved tachymetric scale completes the racing look. Inside is the Manufacture chronograph Calibre MT5813, a chronometer certified automatic movement featuring a column-wheel with vertical clutch and offering 3 days of power reserve. 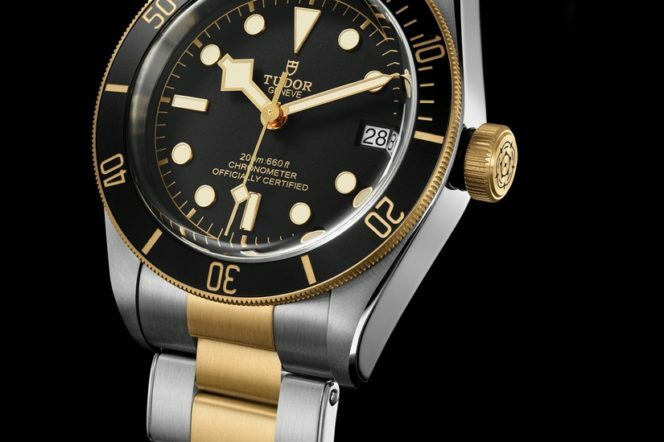 Capitalising on the popularity of dive watches, Tudor is also extending the Heritage Black Bay range with the inclusion of an all-steel model as well as a slightly more formal looking steel and gold version. The former features a stylishly understated, brushed steel bezel insert and red text on the dial, while the latter features a yellow gold bezel with a matt black anodised aluminium disc and gold markings. The distinctive, oversized screw-down winding crown is also in yellow gold. 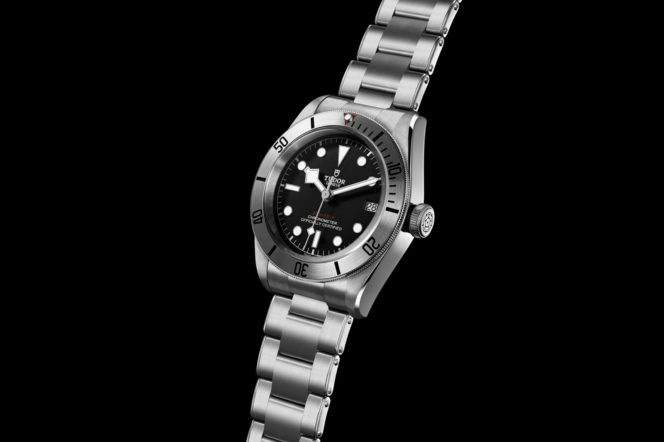 Both models are presented in a steel, 41mm polished and satin finished case and are rated waterproof to a depth of 200m, more than enough for recreational divers. Inside of each is the new Manufacture Calibre MT5612, a COSC-certified automatic movement which introduces a date function into the Black Bay family and offers 70 hours of power in reserve. 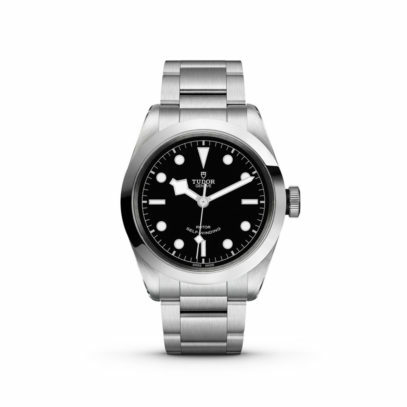 Rounding out the new additions is the Heritage Black Bay 41, an upsized version of the highly popular (yet criminally small) Heritage Black Bay 36. 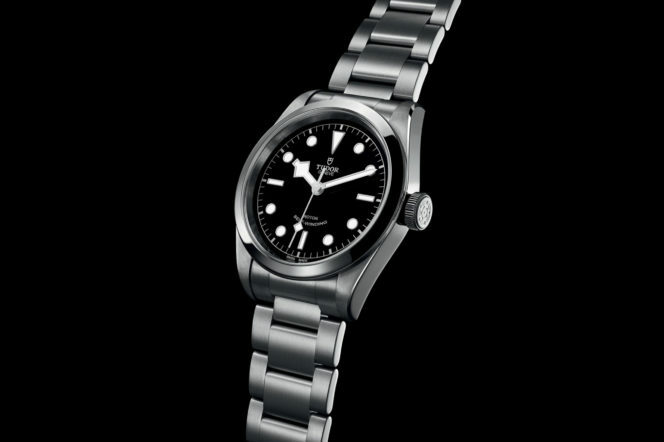 While it retains the core DNA of the Black Bay collection – snow-flake hands, high-contrast dial, oversized crown – it has somewhat of a more refined feel to it. The big news here however, is the case. 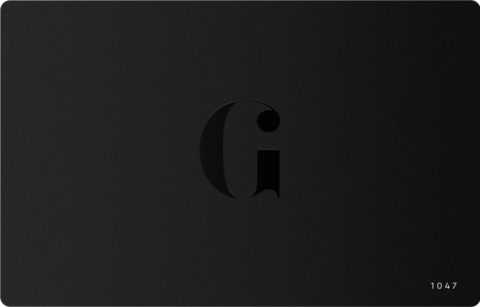 Not only has the diameter been increased to 41mm – a move sure to be welcomed by the brand’s legion of fans – but the entire middle case has been redesigned and slimmed down, making it well suited for wearing with a suit. Likewise a flat sapphire crystal has been used, which sits flush with the fixed bezel in polished steel, making it easy to slide the watch away discreetly under your cuff. And while it may not be a true dive watch, the water resistance rating of 150m means you can still wear it to the pool or beach. 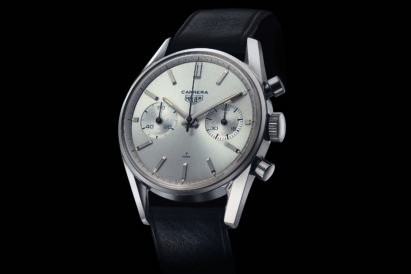 It’s powered by the automatic Calibre 2824 and offers a max power reserve of 38 hours. All four models are offered on your choice of either a steel (or steel and gold in the case of the S&G model) bracelet or a leather strap with steel folding clasp. In addition, and irrespective of your bracelet/strap choice, the watches also come with a special fabric strap. A signature of the Heritage line, the fabric strap is woven on 19th century Jacquard looms by a 150-year-old family firm from the region of St-Etienne in France. Perfect for those more casual occasions or for when you just feel like having something a little softer on the wrist. 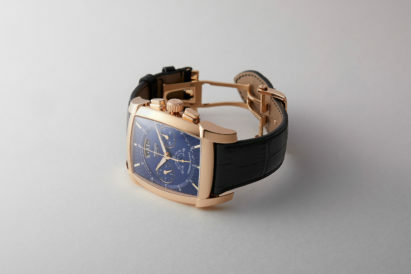 Tom Mulraney is the Managing Editor of online watch magazine thewatchlounge.com.